Award Year: 2008 During the years immediately following the passage of the Civil Rights Act of 1964, gaps in health and access to medical care between black and white Americans began to narrow. How did civil rights legislation and newly created social programs help lead to those health improvements? Sherman A. James, Ph.D. probes this question in his project, After the Walls Came Tumbling Down: The Health Legacy of the 1960's Civil Rights Era in a Southern Community. Through a case study of Pitt County, North Carolina, a poor rural southern community, Dr. James looks at the activities of those who led the desegregation of the county hospital and efforts by citizen activists, voluntary organizations, community leaders, and the press to open the doors of opportunity. Using the fundamental cause framework developed by Investigator Awardees Jo Phelan, Ph.D., and Bruce Link, Ph.D., Dr. James analyzes how access to money, knowledge, prestige, power, and social connections is linked to population health and to the success of public policies. His findings should help illuminate the role civil society plays in distributing life-enhancing resources more fairly and in facilitating or impeding public policies aimed at improving the health of all Americans. Sherman A. James is a research professor in both the Emory University School of Public Health and College of Arts and Sciences. Perviously he was the Susan B. King Distinguished Professor of Public Policy in the Sanford School of Public Policy and professor of sociology and community and family medicine at Duke University. Prior to joining Duke University, he taught in the epidemiology departments at the University of North Carolina-Chapel Hill (1973-89) and at the University of Michigan (1989-03). At Michigan, he was the John P. Kirscht Collegiate Professor of Public Health, the Founding Director (1998-2003) of the Center for Research on Ethnicity, Culture and Health (CRECH), chair (1999-2003) of the department of health behavior and health education, and a senior research scientist in the Survey Research Center at the Institute for Social Research. A social epidemiologist, Dr. James' research focuses on racial and ethnic inequalities in health status, and health care, and community-based and public policy interventions designed to minimize, and ultimately eliminate, these inequalities. Dr. James was elected to the Institute of Medicine of the National Academy of Sciences in 2000. In 2001, he received the Abraham Lilienfeld Award from the Epidemiology section of the American Public Health Association for career excellence in the teaching of epidemiology. He is a fellow of the American Epidemiological Society, the American College of Epidemiology, the American Heart Association, and the Academy of Behavioral Medicine Research. In 2007-2008, he served as president of the Society for Epidemiologic Research (SER). 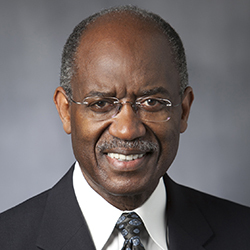 Dr. James has served on numerous NIH Study Sections and editorial boards of scientific journals; the latter include Associate Editorships of Ethnicity and Disease and the American Journal of Public Health. Dr. James received his Ph.D. (Social Psychology) from Washington University in St. Louis (1973).